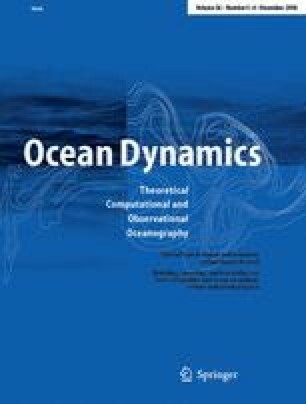 Series of sensitivity tests were performed with a z-coordinate, global eddy-permitting (1/4°) ocean/sea-ice model (the ORCA-R025 model configuration developed for the DRAKKAR project) to carefully evaluate the impact of recent state-of-the-art numerical schemes on model solutions. The combination of an energy–enstrophy conserving (EEN) scheme for momentum advection with a partial step (PS) representation of the bottom topography yields significant improvements in the mean circulation. Well known biases in the representation of western boundary currents, such as in the Atlantic the detachment of the Gulf Stream, the path of the North Atlantic Current, the location of the Confluence, and the strength of the Zapiola Eddy in the south Atlantic, are partly corrected. Similar improvements are found in the Pacific, Indian, and Southern Oceans, and characteristics of the mean flow are generally much closer to observations. Comparisons with other state-of-the-art models show that the ORCA-R025 configuration generally performs better at similar resolution. In addition, the model solution is often comparable to solutions obtained at 1/6 or 1/10° resolution in some aspects concerning mean flow patterns and distribution of eddy kinetic energy. Although the reasons for these improvements are not analyzed in detail in this paper, evidence is shown that the combination of EEN with PS reduces numerical noise near the bottom, which is likely to affect current–topography interactions in a systematic way. We conclude that significant corrections of the mean biases presently seen in general circulation model solutions at eddy-permitting resolution can still be expected from the development of numerical methods, which represent an alternative to increasing resolution. An erratum to this article can be found at http://dx.doi.org/ 10.1007/s10236-009-0180-y. This work is a contribution of the DRAKKAR project. Support to DRAKKAR comes from various grants and programs listed hereafter. French national programs GMMC, PATOM, and PNEDC. PICS 2475 from Institut National des Sciences de l’Univers (INSU) and Centre National de la Recherche Scientifique (CNRS). Kiel SFB460 and CLIVAR-marin (03F0377A/B) supported by Deutsche Forschungsgemeinschaft. European integrated project MERSEA. Computations presented in this study were performed at Institut du Développement et des Ressources en Informatique Scientifique (IDRIS). Finally, we would like to thank P. Niiler, N. A. Maximenko, and J. C. McWilliams who kindly made their data sets available from the Web.